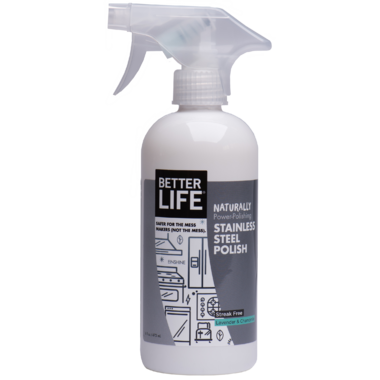 Better Life Stainless Steel Polish is perfect for when dirty little hands and wet noses turn a clean refrigerator door into a wasteland of smudges, splotches, and streaks. This natural stainless steel cleaner cuts through the grease and dirt, creating a protective barrier that’s resistant to daily fridge raids. DOES NOT CONTAIN: Sodium Lauryl/laureth sulfates, Petrolum solvents, Parabens, Ethers, Synthetic fragrances, Alcohol, Ethoxylates, Dyes. Directions: Spray it on stainless steel appliances: refrigerators, dishwashers, ovens, cooktops, and range hoods. Also great on chrome, nickel, titanium, and other fine metal surfaces. Shake, give the surface a spritz, and wipe with a clean, dry cloth. Buff for a long-lasting brilliant shine. While Better Life is non-toxic, it's better as a cleaner than a beverage. Don't drink, and keep out of reach of children. My appliances look brand new again! Worked like a charm and smells lovely. Will buy again.